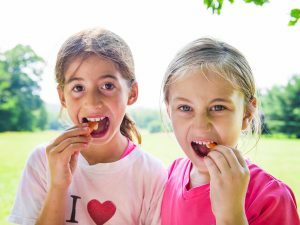 We provide two healthy, kosher snacks for our campers every day. Our snacks are healthy and varied and include fresh fruit and vegetables that will keep your children nourished and satisfied all day long. We ask that campers pack a refillable water bottle each day. Water refill stations are scattered throughout camp and refilled regularly. Lunch at Ramah is BYOL. Campers should pack a dairy or pareve lunch; no meat, please. Lunches will be stored in a cool space throughout the morning. We ask that parents refrain from sending their children with peanut or treenut products in order to ensure a safe eating environment for all campers. Please contact us if you have any questions about nut-safe food. Ramah Day Camp is a kosher camp. The kitchen at the Wellspring Conference Center is kashered annually by our camp rabbi prior to the start of the season.